The chicken egg is made of shell with membranes, protein and egg yolks. The crust constitutes 10% of the egg’s weight, it contains about 3.5% of organic components and about 95% of minerals (mainly calcium carbonate). The shell protects the egg content from impurities and allows gas exchange. The protein is about 60% of the egg weight, while the actual egg cell (yolk) is about 30% of its weight. The egg yolk contains the backup materials necessary for the development of the embryo. The chemical composition of the egg is relatively stable and extremely rich. In the further part of this article I will try to review its individual components and more. One medium-sized egg contains about 71.5 kcal, of which about 44.7 comes from fats, 25.2 from proteins and 1.6 from carbohydrates. When writing a medium-sized egg, I will refer to an egg weighing 50g. One medium egg provides approx. 6.3 proteins. Half of it comes from protein and half from yolk. 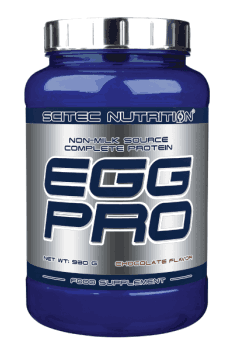 The egg protein is a protein characterized by high biological value. Of all products, it has the richest amino acid composition, contains all the essential amino acids exogenous, that is, those which the human body does not produce. The table below shows the proportion of individual amino acids in one medium egg. 574 mg of omega-6 fatty acids. One medium egg contains about 211 mg of cholesterol and it is thanks to it that it arouses much controversy, it is blamed for causing cardiovascular and cardiovascular diseases. Cholesterol is formed in every human cell and performs an extremely important role. Its synthesis is very energy-intensive and the body eagerly supports cholestrol from food. The more we deliver it in the food, the less it will be made by our orgazism. In healthy people, these mechanisms are dependent, so the amount of surgical cholesterol does not have a significant effect on the amount of circulating cholesterol in the blood. Most recent surveys indicate that the relationship between these relationships is very small. An example of the fact that the consumption of eggs has no direct effect on heart disease is a study that lasted 14 years. During its duration, about 120,000 healthy women and men would be tested, consuming one or more eggs daily, and it was found that the risk of a heart attack or stroke was not increased in relation to people whose diet included less than one egg per week. A small increase in the risk of developing heart disease was noted only in diabetics consuming one egg a day in relation to people who eat it rarely. Another example is the study in which 2 eggs (about 400 mg cholestrol) per day for 6 weeks were added to the diet of 24 healthy people. All people have been instructed not to change their previous habits related to the way of reviving. On its basis, it was proven that the level of total cholesterol increased by 4%, while HDL by 10%. Both the ratio of total cholesterol to HDL, as well as triglycerides and LDL did not change significantly. In healthy people eggs should not be strictly limited – this is the statement of scientists after this test. In another study, 24 young men were fed a diet in which 30% of the calories were from fats. The men were divided into 4 groups in which the supply of cholestrol from eggs was 128, 283, 468, 859 mg / day for groups I, II, III and IV. The average level of cholestrol after this study was 155,161,162 and 166 mg / dl. Take the lessons out yourself. Carotenoids are a group of organic chemical compounds found in chloroplasts and chromophores. In the human body, they occur in the largest amounts in the retina of the eye. They are great antioxidants, they protect eyes against free radicals, the source of which is ultraviolet radiation. Carotenoids such as lutein and zeaxanthin (yellow and red carotenoid respectively) occur in large amounts in eggs. Lutein acts as a filter protecting against UVA and UVB radiation, and thanks to its antioxidant properties it prevents damage to the retinal vessels of the retina and photoreceptors of the macula. Studies have shown that high supply of lutein and zeaxanthin reduces the risk of cataracts by 20% and the degradation of the macula by 40%, which is the cause of blindness. It is a phospholipid found in egg yolk. Lecithin, due to the presence in every cell of the body plays an extremely important role. It has emulsifying properties, breaks down fats and cholesterol into small particles preventing them from sticking to the blood vessels. Linoleic acid, a prostaglandin precursor, makes up about 50% of lecithin, which affects the regulation of blood pressure and has anti-inflammatory and anticoagulant effects. Lecithin dissolves cholesterol in bile and protects against the formation of gallstones. In addition, it is necessary for the proper functioning of the nervous system, it participates in metabolic processes, delays the aging process. Choline is part of phospholipids (lecithin and sphingomyelin), reduces fat deposition in the liver, is a substrate for the production of acetylcholine, participates in the formation of cell membranes and cytoplasmic. Studies have shown that choline administered during pregnancy influences the development of memory in infants. Eggs are her perfect source, one medium egg contains about 126 mg of choline. Betaine is produced from choline and glycine. Betaine reduces homocysteine, a well-known factor that increases the risk of cardiovascular disease. Its high level is a very high probability of coronary heart disease. Eggs contain almost all vitamins and minerals necessary for the proper functioning of the human body. The exception is vitamin C, which is not present in eggs due to the possibility of its being synthesized by the body of a hen. The most digested, soft-boiled eggs are best absorbed. Easy to digest is also steamed scrambled eggs. Eggs cooked above 10 minutes are heavier in digestion, and in addition, such cooking causes vitamins and lowers their nutritional value (even by about 40%). As a result of such a long cooking, a green rim around the yolk becomes a result of the combination of sulfur and iron. The egg is a small product that can be scalded in butter, due to the low temperature at which its protein is cut (about 60 ° C), and at which no toxic acrolein is produced. Eggs should not be eaten raw due to their sensitizing properties, the possibility of salmonella infection and the presence of avidin, which blocks the absorption of biotin. Biotin deficiency, however, contributes to to the feeling of tiredness, dry skin, susceptibility to depression and increased cholesterol. Egg protein is the main source of allergens and just after milk proteins, it is the most sensitizing product in children. Allergy to egg white in adults is quite rare. Owotransferine, ovomucoid, ovalbumin, and lysinzyme are the most sensitizing proteins. Already 10 mg of allergen can cause clinical symptoms. It should also be remembered that boiling eggs does not cause them to lose their sensitizing skills. There are also allergens in the egg yolk, but they are believed to have poor sensitizing properties and are only threatening when consumed in raw form. When we suspect eggs of the cause of allergies, they should be excluded from the diet to see if it really is. It is very important to exclude a given product for at least 3 weeks, because it will allow to “saturate the allergen from our body to a large extent. Re-introduction of eggs after this period will allow us to determine if they are the cause of our allergy. Low temperature slows the aging process of eggs, so keep them in the fridge, in a bowl or box so that they have a constant supply of air. Lay the eggs with the pointed tip down so that the yolk remains inside the egg, away from the air chamber. In this way, eggs can be kept for up to three weeks. As I mentioned, the low temperature inhibits the aging process but does not eliminate it. During storage, a gradual breakdown of protein and vitamins and rancidity of fat occurs. This process is slightly inhibited by the natural protective layer covering the shell, so do not wash the eggs before putting them in the fridge. Eggs age more quickly at room temperature. One day of storage of eggs at room temperature is five days of storage in a refrigerator. The yolks themselves can be stored in the refrigerator flooded with a small amount of water in tightly closed containers. The protein can be stored in a refrigerator in hermetically sealed containers for at least 3 days.